(partial) Foreword. Preface. The solubility of gases in liquids: 1. Hydrogen sulfide in aqueous solvents: Water. Solutions of weak or non-electrolytes. Solutions of strong electrolytes. Sea-water. Solutions of ammonia. Solutions of alkanolamines. 2. 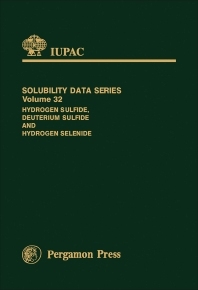 Hydrogen sulfide in non-aqueous solvents: Critical evaluation data. Hydrocarbons. Alcohols. Ethers and polyglycols. Other compounds of carbon, hydrogen and oxygen. Compounds containing silicon. Compounds containing halogen. Compounds containing nitrogen. Compounds containing sulfur. Compounds containing phosphorus. Deuterium sulfide in deuterium oxide. Hydrogen selenide in aqueous and non-aqueous solvents. System index. Registry number index. Author index. Published solubility data for the title compounds in pure aqueous, mixed aqueous and non-aqueous solvent systems have been critically evaluated; recommended values are indicated where appropriate. Literature coverage is complete to January 1987. Many of the systems included are used to remove hydrogen sulfide in industrial processes, and industrially important systems including carbon dioxide are also discussed. For inorganic, physical and organic chemists, and chemical engineers.